It was sunny and over 20 degrees. I parked on Rosewell avenue and crossed the school playground. Burke Brook flows under the playground and exits into an open channel just inside the woods at the east end of the baseball diamond. This little section of the trail crosses the brook on a footbridge. The ravine has been filled in at Duplex Ave which creates a steep climb up over the road. The stretch of brook between Duplex and Yonge street is all underground. 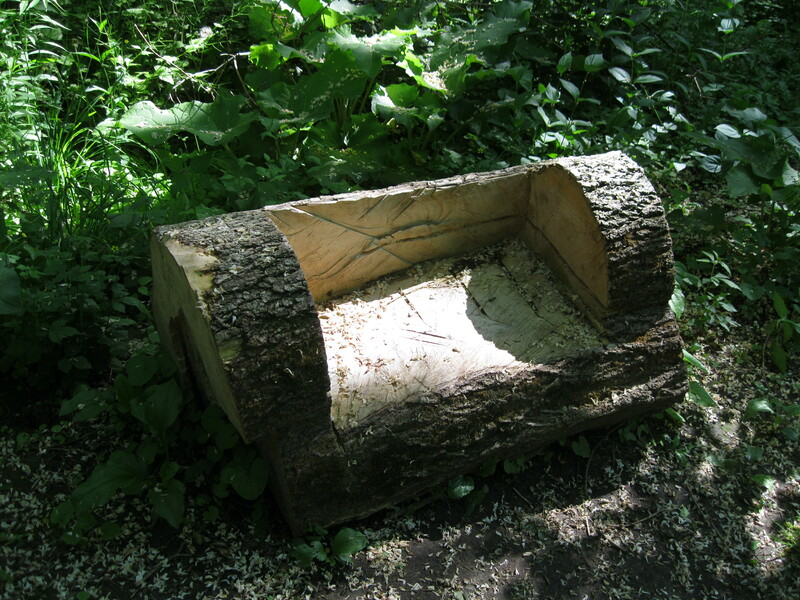 One of the city workers who cleaned up the mess of fallen trees that littered the parks after last December’s ice storm turned this log into a bench. Burke Brook crosses Yonge street underground where it enters Alexander Muir Gardens. Alexander Muir was born in Scotland in 1830. He died in Toronto in 1906 after serving as a teacher in several Toronto area schools. In October 1867 Muir wrote The Maple Leaf Forever to commemorate Confederation. It was Canada’s National Song but was not adopted by the french who had written O Canada in french in 1880. In 1980 we adopted O Canada for our official National Anthem. 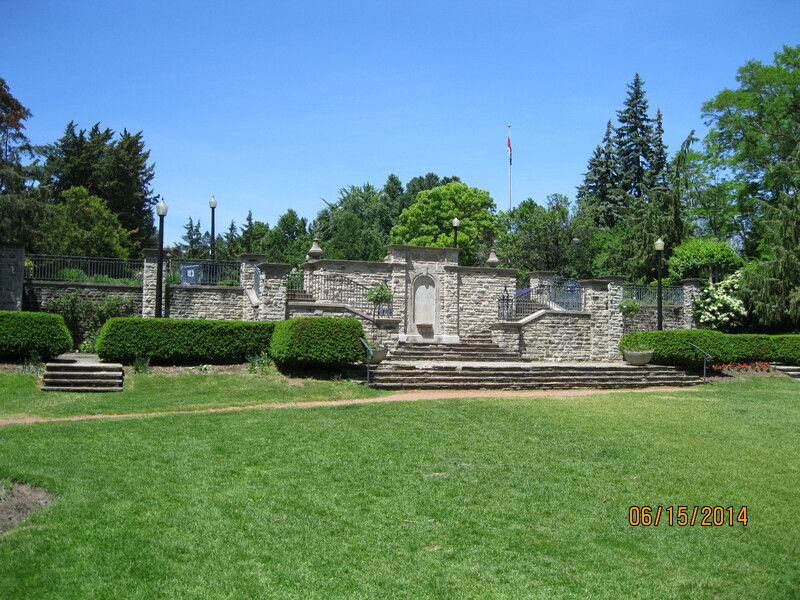 A large garden was built in his honour in 1933 on Yonge St, just north of Lawton Blvd. It was moved to this location in 1952 to facilitate construction of the Yonge street subway. The garden has a wide variety of trees and flowers and many looping paths and trails that make it an ideal place to get lost for awhile. Just past the Alexander Muir gardens the brook flows out of its underground channel into the open. 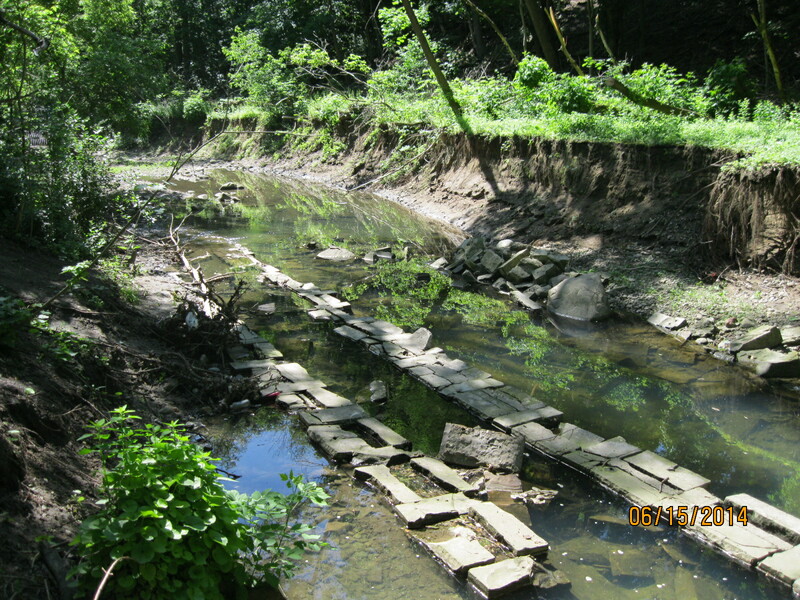 It was lined with cut stone in 1964 to make a deep channel to prevent erosion. As the photo below shows, the water has little respect for the efforts of man. The erosion extends out on both sides of the original stonework. I was amazed at how much soil has been removed by such a small flow of water. The brook passes through Blythwood Ravine and then into Sherwood Park. The Carolinian Forest in the park contains White Pine, Eastern Hemlock, American Beech, Red and White Oak and Sugar Maples that are over 150 years old. Along the way there is a lot of groundwater discharge and the hillsides are seeping with water. 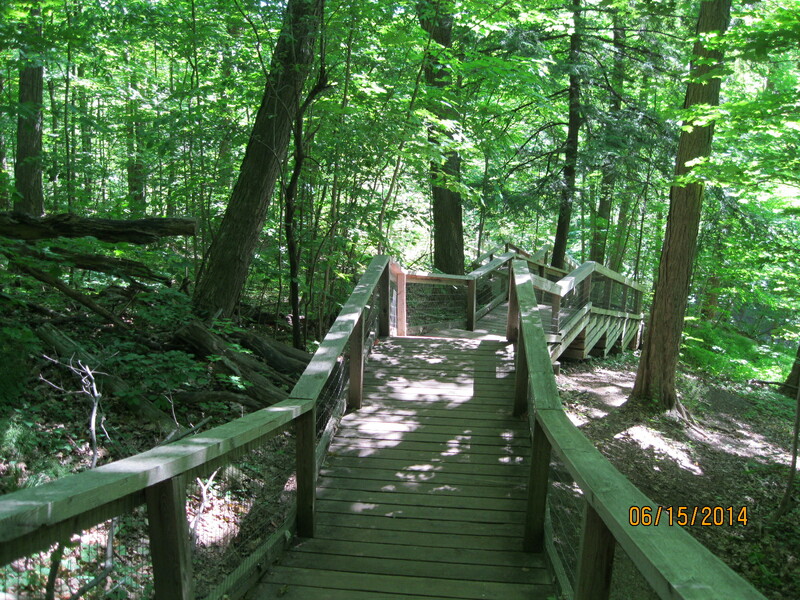 A long stretch of the trail is covered with a boardwalk that seems to contain one too many stairs. 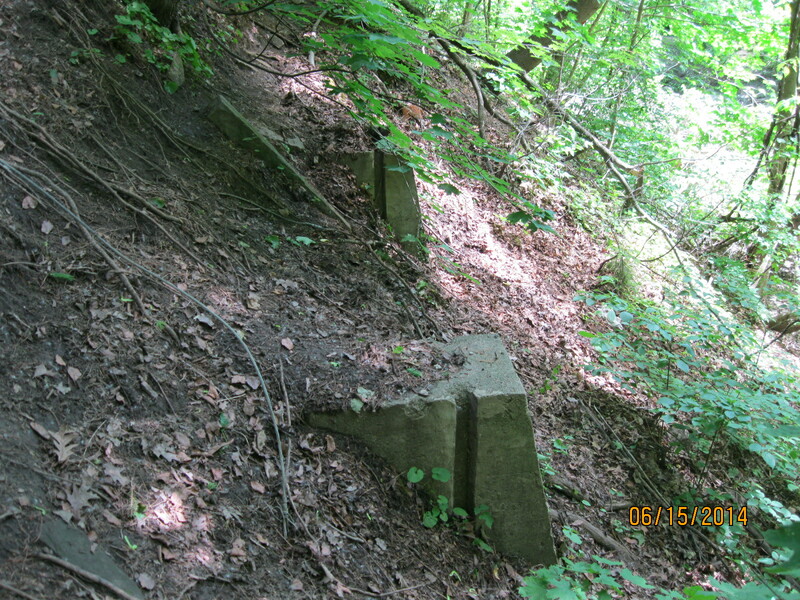 Just before you reach Bayview Avenue there are four concrete abutments about 10 feet up the hill on the north side of the valley. They are somehow related to an old road alignment that brought Bayview down into the valley to cross Burke Brook. It then climbed the hill behind what is now Sunnydene Crescent. 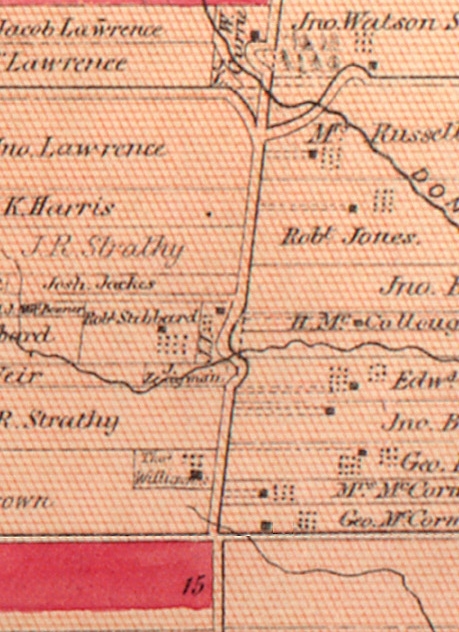 Bayview Avenue (1st Line East) runs up the middle of the historical Atlas map below. The jog in the road (and the actual road allowance) are seen in the centre of the map. Bayview Ave makes a little “s” curve where it crosses Burke Brook. The road allowance has been drawn in by the mapmaker with dotted lines. Between 1947 and 1953 the ravine had a large culvert installed and then a berm was built to fill in the valley to straighten out the road and make it almost level. When you cross Bayview Ave to go back down to the bottom of the ravine you will find the descent is one of the steepest slopes on any trail in the GTA. For this reason, the settlers chose to run the road west along the hillside as it angled toward the bottom of the ravine and then back up on an angle on the other side. You are now in the ravine below Sunnybrook Hospital. This property belonged to Joseph Kilgour who made his fortune as head of Canada Paper Company. He owned a large estate which his wife donated to the city in 1928 as a public park called Sunnybrook Park. Sunnybrook Veterans Hospital, built on the corner of the property, was opened in 1946 to help deal with the influx of veterans following the second world war. It is likely that the straightening of the road was done to improve access to the hospital from the south. 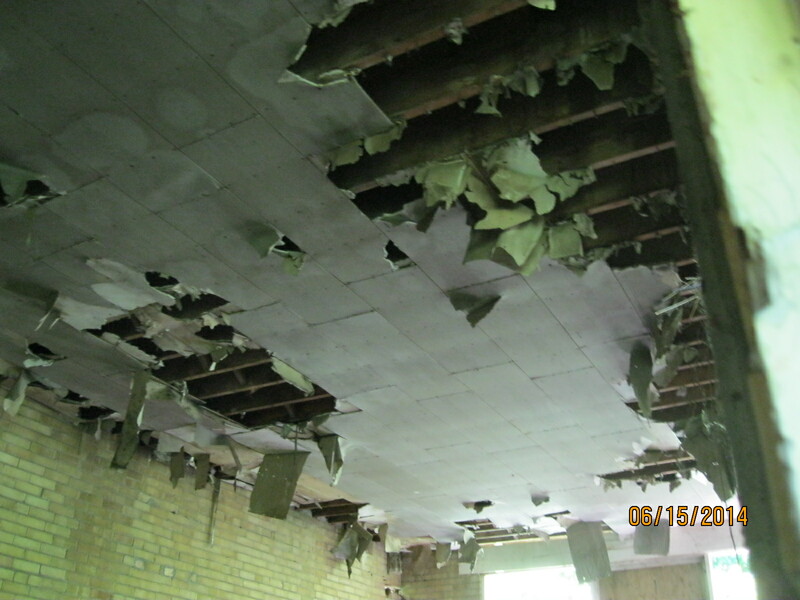 A building from the 1950’s now stands abandoned in the woods near the hospital. This appears to have been an electrical generating building that has since become obsolete. Turning to your right when you reach the main trail in Sunnybrook Park will bring you to the mouth of Burke Brook where it empties into the West Don River. 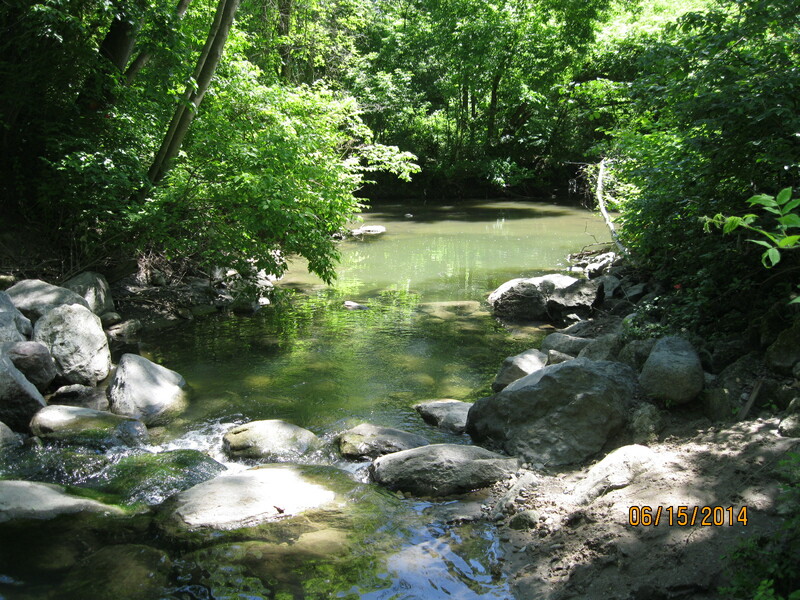 This entry was posted in Don River, Hiking GTA and tagged Alexander Muir Gardens, Burke Brook, Don River, GTA, Hiking, Toronto on June 19, 2014 by hikingthegta.